Over the past year, Bitcoins have been generating buzz as a new alternative to currency. Bitcoins have gone from as low as $5.00 up to more than $1,100.00. 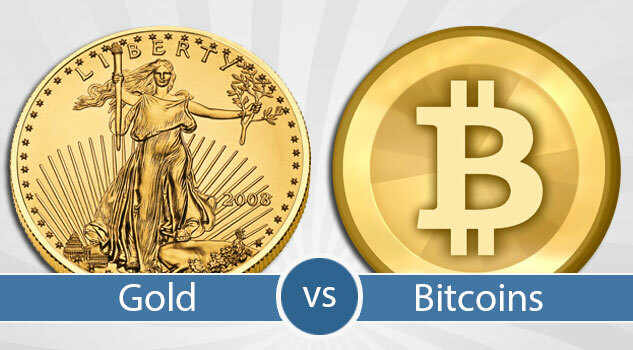 A few individuals have asked about Bitcoins as an alternative to gold, so we wanted to discuss several aspects you should consider when comparing Bitcoins with Gold. Bitcoins are a form of digital currency. A Bitcoin is stored in a “virtual wallet” and may be sold or traded. Each “coin” has a value which is determined by the normal supply-and-demand market factors. Bitcoin advocates promote the fact that this form of currency is decentralized which means it is outside the control of governments or central banks. Modeled after the process of Gold mining, Bitcoins are mined by individuals using a computer process. Instead of investing in expensive machinery to pull your treasure from the earth, you invest in computing power to solve complex cryptographic 64-digit puzzles to download your “coins.” Similar to gold, the more money you invest in mining will not always result in more production. Bitcoins have a finite amount and are difficult to mine. Bitcoins are generated periodically every 10 minutes, however, there is a hard limit of 21 million Bitcoins that will only ever be created. With words like “cryptographic 64-digit puzzles” used to describe the Bitcoin mining process, many traditional investors are turned off from this seemingly complex process and prefer the credibility, simplicity and historical value of gold. While many Bitcoin advocates highlight its ability to operate outside the control of government and central banks, some critics have called this new form of currency “fake” or “a modified Ponzi scheme.” Traditional investors believe it’s hard to take a currency seriously that is not controlled by a banking institution or world government. While Bitcoin awareness is growing, many people believe Bitcoins have a long way to go before investors will consider them as an established currency. Overall perspectives on Bitcoins may change with time, but Gold still brings a long history of credibility and security against inflation. In regards to gold or Bitcoin value, stability should be one of the first aspects discussed. While some believe Bitcoins offer the ability for a better currency, traditional investors prefer to rely on gold’s historical track record. Bitcoins are still in their infancy and have many more years to go before investors will see a reliable track record. Gold is a tangible currency that has been accepted the world over for thousands of years. This planet only has so much gold and it’s difficult to locate, mine and refine. These factors make it a rare commodity and therefore give gold its value. Gold has long been the smartest choice to represent “money” due to its durability, rarity and ease of divisibility. American Bullion believes Gold is still the best option to provide safety, security and stability against inflation and a struggling economy. Starting in 2013, American Bullion began accepting Bitcoin as a form of payment for individuals looking to purchase physical gold or silver. To learn more, call American Bullion at 1-800-326-9598 to speak with a Bitcoin specialist. American Bullion has assisted thousands of individuals with the process of adding gold, silver, platinum and palladium to their individual retirement accounts. If you are interested in purchasing precious metals for your IRA, call American Bullion at 1-800-326-9598 to speak with a precious metals specialist about the benefits of gold or silver in a self-directed IRA.